JOIN BACKYARD BARTER where neighbors barter handmade, homemade and homegrown items. 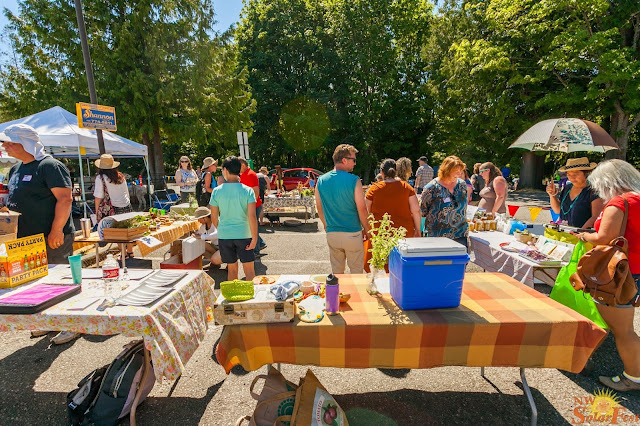 The July Barter is at NW SolarFest, July 28 at Shoreline Community College, 16101 Greenwood Ave N, Shoreline 98133. Set up at 2pm, bartering begins at 3pm. The focus is on the homemade and the homegrown. This can span a huge range of stuff - here is a partial list of trade items we have seen: fresh eggs, honey, flower, bulbs, seeds, baked goods, handmade soap, edible plants, garden seeds, fruit/vegetables/herbs, kimchi, beer/mead and jams/jellies, homemade yogurt, homemade laundry soap, homemade skin care products, redworms for vermiculture, compost tea, ornamental plants. The exchange value of any given item is up to each barterer. The process is a simple one, you just ask 'would you like to trade your (eg jar of blackberry jam) for my (eg loaf of bread)..' or whatever you are trading. Sometimes people will say 'no thank you' but most often the trade works perfectly. Remember, this is a cash-free exchange. Sign in at the Barter Area between 2 and 2:45. The sign-in sheet will have space for item descriptions, but some people find it helpful to prepare labels and/or ingredient lists ahead of time. Then set up your items. Once you have your goods arranged you can check out the other items offered for trade and meet your neighbors. Trading starts at the beginning of the second hour, and we request that people wait for the 'bell' to start their actual trading.